Due in part to Democratic U.S. House pick-ups in a couple of deep red states, for the first time in five election cycles, there will be slightly fewer states represented by only one party at the convening of the 116th Congress in January. The number of single-party delegations had increased from just six in the 111th Congress (2009-2011) to seven in the 112th, nine in the 113th, 13 in the 114th, and 15 in the 115th. 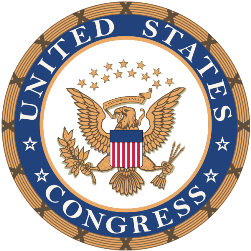 That marked the largest number in 60 years, matching the number when the 85th Congress convened in 1957. However, that number will drop to 14 states in January. Democrats notched picks up in U.S. House contests in Kansas’s 3rd CD, Oklahoma’s 5th CD, and Utah’s 4th CD to end the GOP hold over all congressional seats in each of those states. Democrats will continue to control all U.S. Senate and House seats in the six states that they currently hold in the 115th Congress (Connecticut, Delaware, Hawaii, Massachusetts, New Hampshire, and Rhode Island) plus add New Mexico (where they picked up the Republican-leaning open 2nd CD) to bring their total to seven states. That is the largest number of all-Democratic congressional delegations since the landslide Election of 1964 when the party also held all seats in seven states: Alaska, Arkansas, Connecticut, Louisiana, Nevada, New Mexico, and Rhode Island. The number of all-Republican delegations fell from nine during the 115th Congress (Alaska, Arkansas, Idaho, Kansas, Nebraska, Oklahoma, South Dakota, Utah, Wyoming) to seven in the 116th – losing their electoral monopolies in Kansas, Oklahoma, and Utah but adding North Dakota to their resume after unseating Senator Heidi Heitkamp. An additional 12 states are just one seat away from a single party holding every U.S. Senate and U.S. House seat – eight for the GOP and four for the Democrats. Republicans came up just shy in unseating Democratic senators in Montana (Jon Tester) and West Virginia (Joe Manchin) and lost one U.S. House seat in Kansas, Kentucky, Louisiana, Mississippi, Oklahoma, and Utah. Democrats, meanwhile, came up one U.S. House seat short of sweeps in Maryland, Nevada, New Jersey, and Oregon. Despite the slight drop from the 115th Congress, the 14 states represented by one party in D.C. during the 116th is still twice the average level seen over the previous half-century. From the 91st (1969-1971) through the 115th (2015-2017) Congresses, an average of only 7.1 states were represented by a single political party. 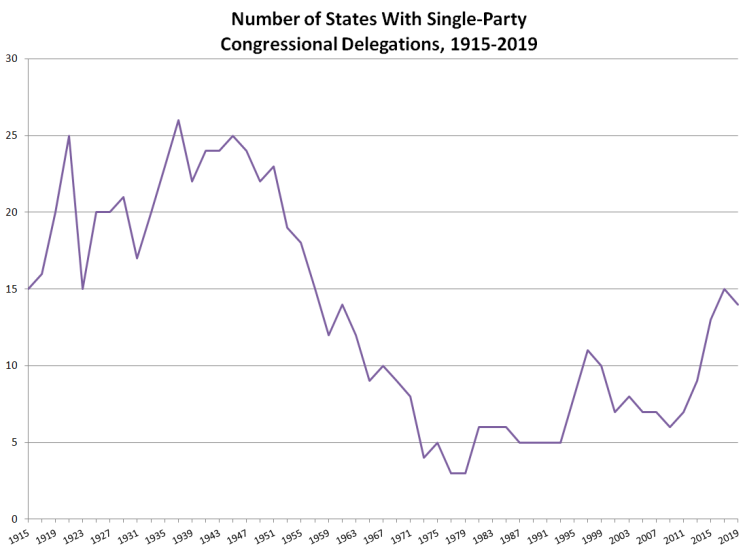 While the number of single-party representation in the states has been at an elevated level in recent cycles, the trend is not without precedent. From the 64th (1915-1917) through the 85th (1957-1959) Congresses, no fewer than 15 states sent single-party delegations to D.C. with an average of 20.6 states doing so each cycle. Democrats peaked at 23 states during the 75th Congress after the 1936 landslide while the GOP hit a high water mark during the 67th Congress after lassoing every seat in 17 states in the Election of 1920. Democrats have controlled all seats in at least one state during each of these 53 election cycles since the ratification of the 17th Amendment with a low-water mark of one during the 97th Congress (1981-1983, Hawaii). The GOP has done so in all but one congress – the 95th (1977-1979). 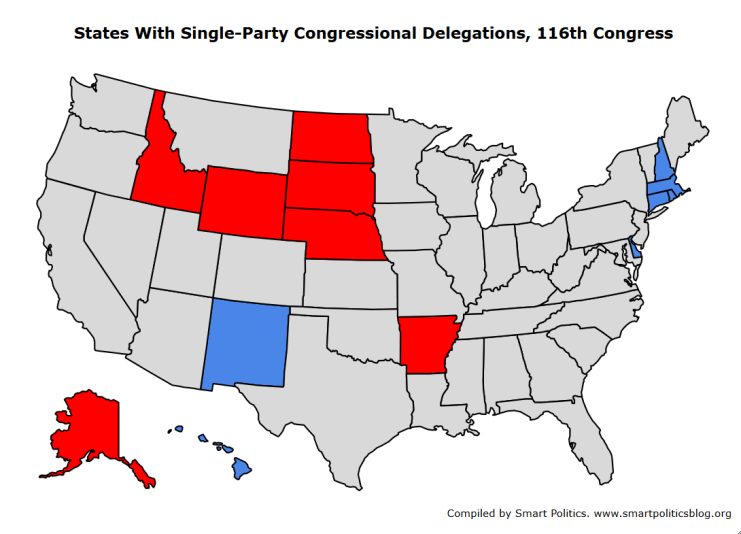 Overall, states have sent single-party delegations to Congress 703 times since the 64th Congress (1915-1917). A total of 425 of these were all-Democratic and 278 were all-Republican. Nearly every state has sent at least one single-party congressional delegation to D.C. during this 100-plus year span since the direct election of U.S. Senators with the exception of California, Illinois, Missouri, New Jersey, New York, Ohio, and Tennessee. North Dakota is the only state to have logged at least 10+ Congresses with its seats under control of Democrats (12 times) and Republicans (23 times). Of course, Democrats dominated the South for many decades during this span with southern states holding six of the top seven slots for the most cycles with all-Democratic delegations since the 64th Congress: Mississippi (28), Georgia (27), Louisiana (27), Arkansas (26), Rhode Island (26), Alabama (25), and South Carolina (25). Overall, Vermont has tallied the largest number of cycles with an all-Republican delegation since 1915 with 29 followed by New Hampshire (27), Idaho (24), North Dakota (23), Wyoming (23), and Maine (18). The last time the GOP held each of the U.S. House and Senate seats with combined delegations of at least 10 seats between the two legislative bodies was in Iowa (10 seats) during the 84th Congress (1955-1957). Democrats have achieved this feat in Massachusetts (11 seats) since the convening of the 113th Congress in 2013. Across the 53 election cycles since 1914, North Dakota has had the largest number of single-party congressional delegations at 35. Arkansas, New Hampshire, and Vermont are next with 29 followed by Mississippi (28), Georgia and Louisiana (27 each), Rhode Island (26), and Alabama, South Carolina, and Wyoming (25 each). 1 Comment on "Largest Number of All-Democratic State Delegations Headed to Congress in 50+ Years"
1. NE: Though it will never be known with certainty, the nomination of Kara Eastman over former Representative Brad Ashford for the Omaha-based district may well have cost the Ds a chance to pick off a seat that has a similar demographic profile to KS-03, MN-02, et. al. – and break up another R monopoly of a state delegation in the process.